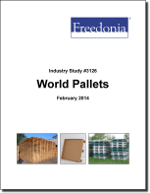 Global sales of pallets are projected to climb 5.0 percent annually through 2017 to 5.1 billion units. The Asia/Pacific region will be the fastest growing market and will surpass North America as the largest. Plastic pallets will grow the fastest based on their ability to be better cleaned and recycled, while wood pallets will remain dominant based on their low cost. This study analyzes the four billion unit global pallet industry. It presents historical demand data for 2002, 2007 and 2012, and forecasts for 2017 and 2022 by product (e.g., wood, plastic), market (e.g., food and beverage manufacturing, warehousing, construction), world region, and for 25 countries. The study also considers market environment factors, details industry structure, evaluates company market share and profiles 51 industry players, including Schoeller Allibert, PalletOne and CHEP.